The Chevrolet Malibu got a little cooler, both inside and out. We think you’re going to love this latest edition as much as we did. When you visit your nearby Chevrolet dealer later this fall, you’re going to see a selection of models that have been upgraded and improved. The car that’s going to capture your gaze and hold onto it the most is the upgraded Chevrolet Malibu. Ever since this car was touted a one of the most attractive on the market, Chevrolet has been looking to make improvements to this and several others cars in the lineup. With that in mind, let’s take a look at what makes the new Malibu the right car for you to drive. 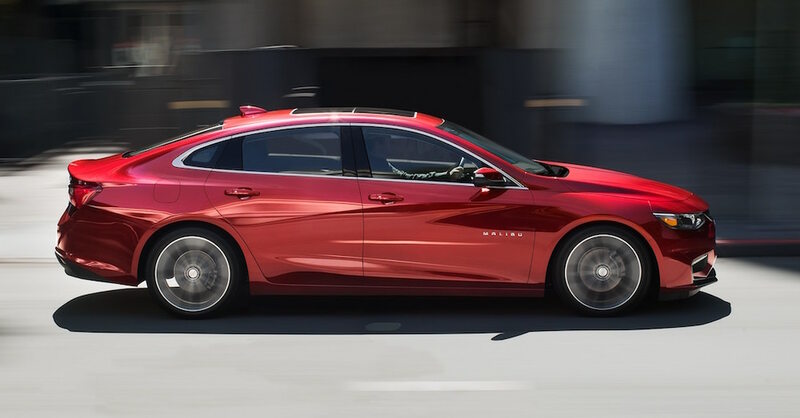 As the Chevrolet Malibu leads the charge toward more impressive upgrades and the qualities you want when you drive, one version you’re going to seriously want to take on the road is the Malibu RS. This is a car that offers you sporty style with 18-inch machined wheels, a black sport grill, and blacked out features that you’re sure to admire. This package is offered on five of the trims of the Malibu and it uses both powertrains offered to give you the ride choices you want when you head out on the road. This new version of the Malibu offers you a front fascia, grill, and headlights that are all new and look like they belong on performance cars. The headlights are integrated with the upper grill and the lower grill is improved to give the car a more powerful look up front. In the rear, a new valance pushes the dual-exhaust ports toward the corners to give the car a wider appearance and the new taillights offer LED lamps in them in the LT and Premier trims. Other items you can choose in different models of the Chevrolet Malibu include the new standard eight-inch touchscreen, the new Chevrolet Infotainment 3 System, a new reconfigurable information center in the gauges of the Premier model, the Rear Vision Camera which is now standard on the L trim on up, standard heated outboard rear seats for the Premier trim, new interior and exterior colors, and new wheel designs and colors that you can choose. These additional options make it much easier for you to have the Malibu you want to enjoy on the road. It’s easy to see why the Chevrolet Malibu has been one of the most awarded and chosen cars in its class. This midsize sedan is one that offers you the style, the qualities, and the features you’re looking for when you want to head out on the road. Take a look at what this incredible car has to offer you at your nearby Chevrolet dealer and see if it’s the car that you’ll be ready to drive. You’re going to be awed by the look and the addition of the items that certainly make the Malibu a car you can fall in love with.